I have been an entrepreneur as well as worked with several entrepreneurs. Entrepreneurs are problem solvers and often the vision is so clear that they are convinced that their solution or the product will become successful because the value proposition is so clear. Brand is a reason why people are using your product or service. When they decide to purchase something, they are purchasing a promise of a value. They have not yet received the value. That promise is about what customer needs it would address, how it would address them, what if it doesn’t, what if I change your mind, etc. The customers have explicit and/or implicit expectations across all of these. And that is how they perceive your brand. If you deliver higher, you strengthen the relationship; if you fall short, then the expectations go even lower. Uber is losing billions, so why are they still valued at 60+ billion dollars? Because that’s essentially their brand value. It is the relationship that they have built with their customers, and that relationship is strong enough that investors have huge confidence on Uber’s ability to turn the losses into big wins. Just as Brand is about the value given back to the customer, the Business model is about the value to the business. Whatever product or service you provide, it must add value back to the business. We just spoke about Uber. While it is still building its core, it’s okay that it’s losing money. But at some point it’ll have to turn it around and be able to generate more profit. The economics have to work. You can see the impact of this in the recent Facebook quarterly report. Facebook’s Q3 was a blowout quarter. Revenue was $7.01 billion vs. the $6.92 billion expected. Earning per share was $1.09 vs. the $0.92 expected. Their daily active users were 1.18 billion vs. the 1.16 billion expected. Still their stock went down by 8%, which is about $20 billion. The key reason was that their Ad Saturation in the feed is already at a high levels. That limits their ability to grow the revenue. Notice that that Brand is still strong. Their daily active users have increased, even at such high numbers, but their business model needs more work. I think they have smart enough leadership that they will figure it out. Another example I love is Tesla. For a long time, Tesla was not economically viable. Their cost of producing a car was far higher than what they had sold (not just planning to sell) for. They too had a strong promise and a strong associated brand from the early days, but the genius of Elon Musk has been to make the economics work within the confines of that very promise. At the highest level, it is basically about the total costs and total revenue or earnings. But as you dive deeper, you’ll see this is the entire operations of your business, as every part of your business — people, process, assets, everything has a cost and that cost is in the context of the value it delivers. LTV is about the total revenue that can be generated from every customer between the start of their relationship with you through the end of it. This could be a few moments or this could be years. Take the example of Apple. Apple is great at building an ecosystem, not just a product. When one buys an iPhone, Apple gets the revenue. But then as people use the App Store, Apple makes money out of that also, thus increasing the LTV of their customers. So think about how you can maximize the LTV of your customer. A few years back, Apple started giving OS upgrades for free. There is a cost to developing those upgrades, distributing them, supporting them, etc. However, the upgrades add value back to their ecosystem and increase LTV. So it was an explicit decision from Apple to not look for additional revenue from the upgrades, but instead eat that as the cost of customer acquisition. There are so many levers that one can move to impact both the LTV as well as CCA. And as you would imagine, this doesn’t stay static – it keeps evolving. Understanding these and working with these is one of the most critical parts of managing a product or a business. Once you understand these, you can figure out the breakeven point. The Brand and the Business model is the “what.” The “how” governs the Customer response. Take the example of Segway. It was a brilliant innovation in a large market space, received tremendous visibility through huge media coverage and all in all should have been a huge success. But it was only able to sell 1% of its projections. The reason was in the “how.” The product was awkward to use, it could not climb stairs, had to be recharged often, required both hands so people could not even carry an umbrella, they were afraid of falling off, and the local laws were unclear. It was a technology but not a solution to customer problems. Customers could not really hire it for any jobs that they wanted done (Ref: Jobs-to-be-done). So just building a technically great product is not enough, you have to look at it in the customer’s terms. This, I believe, is a big reason why disruption occurs. Lets look at Uber again. It’s not a big deal to technically build an Uber-like app. But Uber took that technology and solved the core problems of the customers — finding a cab, evaluating if it looks safe or not, tracking it, the car experience, paying for it and sharing any feedback. It was all about the customers. They made it aligned to how people wanted the solution to be. Customer Needs: Does your product address an important need of a customer? In the case of Segway, no. In the case of Facebook, yes. Customer Expectations: This is different than the needs. This is if the need is being addressed in the right manner. Anyone who has tried to teach instant messenger to their grandparents understands this. The interaction model, as simple as it seems to us, is just not natural for them. This is the reason the Wii was so popular with the older generation. It was a simple gesture-based console. You give a PS4 to the same people and they’ll struggle. The need is the same in both cases. Since this is mostly about the first interaction the customer has with your product, the first time user experience design (FTUX) becomes a very critical component of ensuring customer adoption. But don’t limit yourself to just that moment of FTUX interaction. It’s so simple and effective. It communicated and it taught how to use the product, and in the process it changed the expectations coming into the first interaction itself. You can do this with email campaigns, advertisements, web copy, etc. With Adoption, the customers start to use your product. But if they do not continue using it, then in most cases your CCA is high and LTV low. Even if you think of expensive products like cars, there is more revenue to be generated from the same customer through service and other fees, as well as future car purchases. 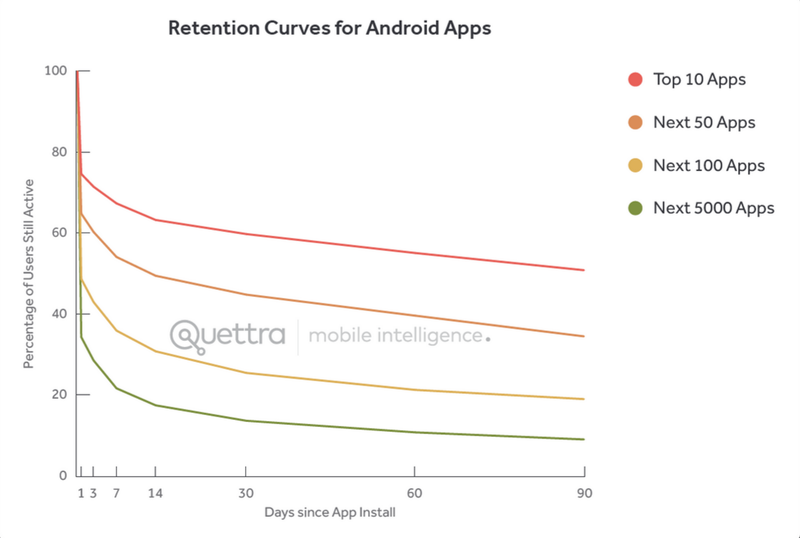 Retention increases your LTV, and since the customer is already acquired, the CCA is very low. It may not be zero, as you will likely have to spend more to keep bringing the customers back. We looked at Facebook financials a few moments back. Notice that the Daily active user metrics is reported. That is the number 1 metric that Facebook focuses on as a company. Focus as in Zuckerberg-level focus. It’s essentially about customer retention. A lot of product improvements are geared towards driving this metric. For instance, they have found a correlation between number of friends and daily activity. So they promote features that increase number of friends. And that is the key. You have to figure out what would keep bringing your customers back. The pace of coming back has to be appropriate to the product. Facebook can expect daily activity, but an expensive car customer cannot be expected to do so. Just the way Customer retention increases the LTV, Customer Loyalty decreases the CAC. The reason being that when customers are loyal, they promote your product. When they promote, your cost of customer acquisition goes way down. Make it easier for people to promote your product. Provide them with a way to send recommendations and then track the actual impact. A lot of people put a Post on Facebook or Twitter link on their products, but don’t really measure if that link has led anything back to their product. And while such a link is still valuable from brand perspective, it is not really giving you an accurate measure of loyalty. So you have to track an actual impact. Audible allows its customers to share an audio book for free with their friends. Only the first book shared this way is free for the friend. But this is a great way to build and capture loyalty. The act of recommending adds value for everyone – the original customer, the new prospect, and Audible itself. And then Audible can track very clearly if the prospect actually became a paying customer or not. In the absence of actual tracking like that, one can use tools like a Net Promoter Score (NPS). NPS is essentially a survey – asking the customers something like “How likely are you to recommend us to your friends?” So it focuses on recommendations as a way to measure loyalty. It is still a less-than-perfect measure as it is not about actual behavior but about customer’s perception. Still, you can observe trends and see if you are moving in the right direction or not. Everything up to this point is about building an engine and figuring out a formula behind a successful business. You take time to shape it, tweak it, move different levers to get them to the right level. But it’s not really successful until you scale it up enough. Scaling is not the same as growth. Growth would simply be earning more revenue or customers. That can be done without truly scaling. For instance, when we look at companies like Yahoo, Blackberry and Nokia, they all were growing, but they were not scaling up from within to be able to drive further growth. They were the same company, just replicating previous growth. Yahoo had the same core technology and products, same with Blackberry and same with Nokia. They were doing more of the same. Contrast that with Amazon. Amazon still does eCommerce as it did when they only sold books. But now they sell over 200 million products. They have scaled up their entire supply chain, warehousing, fulfillment, everything. Paypal is another great example. Paypal’s visible technology was easily replicable. It’s not difficult to build an email-based money exchange service and they could have easily handled more capacity and transactions and so on. However, scaling brought new challenge, like fraud management. As Paypal grew, so did the fraud. At one point in their life (after being very successful) they were losing millions to fraud on a daily basis. They could not become a larger company unless they handled this well. And that’s what they did and did it better than most. It was such a trade secret that they did not even file patents. But that’s what made that successful. Growth is like adding more floors to a building. Scaling is about strengthening your foundation as you build those floors so you can continue to add more. This is a strategic effort, not a tactical one. And that’s where the leaders need to adjust focus to. What are the new problems and challenges that scaling up will bring to your business? You need to look at your processes, tools, communication, and people. How would you ensure the same brand experience with a million customers as you did with the first 100? How would you ensure that you are continuing with a stable business model?